This is quite an extraordinary young lady! I remember the news reports from back in 2012 about a young girl in Pakistan who was shot in the head by the Taliban while she was on her way to school. She miraculously survived. 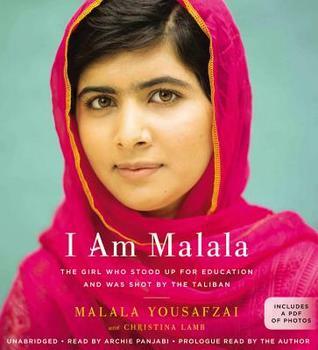 This story is about so much more than Malala. It starts with her equally inspiring father, who founded a school and was his daughter's biggest supporter in her efforts to fight for equal rights for not only girls but for the homeless children who lived in the streets. I really enjoyed hearing the story of Malala's father and what shaped his interest in education and then of course the influence on his daughter. In a cultural society that holds higher regard for male offspring, Malala's family definitely went against the grain. 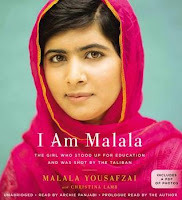 I enjoyed the beginning and ending of the book best, as the focus was more on Malala and her family. The middle part of the book was very political, which was helpful in the context of the book but less enjoyable. 4 stars!! It was really good, and you should put it on your TBR if you enjoy memoirs!